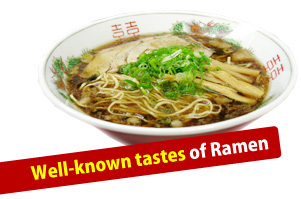 "Onomichi Ramen" became a well known local ramen. Many tourists come to enjoy the popular noodles. You can see people making long lines to get a table. The feature of Onomichi ramen is a soy bean based soup and pork based with flat type noodles. It may sound a little greasy, but it is actually extremely tasty and simple. There are two types of shops which call their noodles in different ways in Onomichi. One way is "Chuka Soba" and the other is "Onomichi Ramen". In fact though, they quite resemble in appearance. The shops which have been in business since postwar days call their noodle "Chuka Soba" while the newly opened shops call theirs "Onomichi Ramen". People's popular gourmet "Onomichi Yaki". 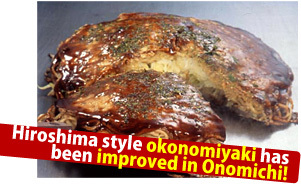 Onomichi Yaki uses gizzards instead of beef or pork, which makes it different from the Hiroshima style. This combination is so unique and special that you can't find it anywhere else. The sizes of most shops are not so big and become full with ten people. It will be quite fun to listen to the conversation among the master of the shop and the local customers speak in Onomichi dialect while your dish is prepared on a large iron plate that is at the center of the shop. It is recommended to order "Zuri Tama Soba" (gizzard, eggs and pan-fried noodles). They might think you know well about Onomichi yaki. 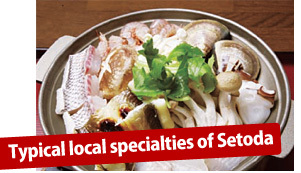 Suigun Nabe is Innoshima's popular local nabe pot dish. It is said that the warriors of "Murakami Suigun" who ruled this region in former times ate this nabe before they went off to war. In that nabe, you will find octopus that plays an important role since they believed in the omen that an octopus eats enemies from all directions, and therefore that they can beat their enemies. Beside octopus, you will find shrimp, eel, shellfish, and seaweed in a soy sauce flavored soup. After finishing the nabe, you will then enjoy putting wheat rice in the soup to make Zosui (boiled rice). This is a typical Setoda's nabe. 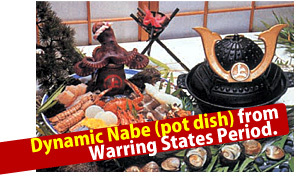 Hamako Nabe was named after "Hamako" (people who worked at salt farms). They ate this kind of nabe for their meal. 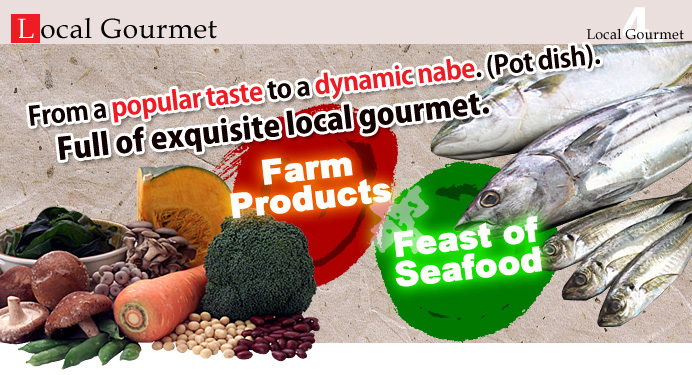 Local seafood such as octopus, oysters and other fresh seafood and vegetables are boiled in a miso based soup. This nabe is full of Seto Inland sea flavor. You can find and taste this nabe at some Japanese inns or at the restaurants in Setoda. 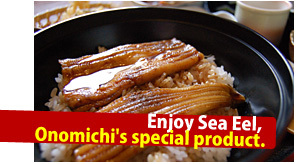 This is a simple bowl with pieces of sea eel which is Onomichi's special product. They are put on hot rice and sweet sauce is poured over it. People generally prefer this simple taste to the taste of eel. You will find this dish in most of the restaurants. Tako-Meshi that is cooked by mixing octopus and rice is very popular in Setoda. 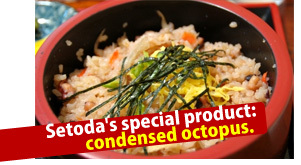 It is also recommendable for children or elderly people because fresh octopus is softer. You can enjoy the unique texture of octopus. 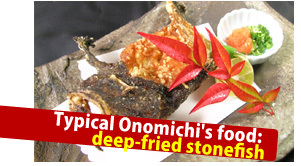 Okoze (stonefish) which is known as an expensive fish is wholly deep-fried. Since it is deep-fried well, you can even eat its bones. The taste is so delicious that you can not imagine it from its face or its figure. Although the dish may be a little expensive, it will be well worth the price.